I recently presented 10 famous ghost pictures and gave you the supposedly true stories behind them. Now I give you 10 more famous examples of some of the most interesting and creepy pieces of ghostly photographs I have ever come across. These photos are intriguing to say the very least. If these pictures are proof of an afterlife is up for debate what is not debatable is that they will invoke strong feelings, most likely a strong feeling of fear. In 1924 two crewmen of the S.S. Watertown were accidentally killed, when they inhaled dangerous gases while cleaning out the ships cargo tank. Their was no where to store the bodies and the ship would not be reaching land for several more days, so the captain ordered that the bodies were to be thrown overboard. Over the next several days every member of the crew including the captain saw the faces of the deceased men peering up at them from the water. When the ship docked in New Orleans the captain of the S.S. Watertown decided to purchase a camera. The ship eventually went back out to sea and the same bizarre ghostly faces began appearing in the water again. This time the captain got a picture of it. A woman was visiting her daughter’s grave that had died tragically at the age of 17. She decided to take a few pictures of her daughter’s headstone. 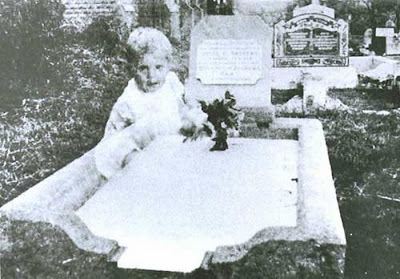 Upon getting her pictures develop the woman was shocked to discover a gleeful toddler sitting on top of her daughter’s grave. The woman did not recognize the child and did not see any children in the cemetery the day the picture was taken. Photographer Chris Brackley was awe struck by the beauty of the interior of London’s St. Botolph's Chruch. He set up his camera and took several pictures of the church. Upon examining his photos he made a very interesting discovery. In the upper-right corner of the photo there appears to be the ghostly apparition of a woman. Brackley claims that there were only three people in the church when he snapped this now infamous photo and none of them were in the loft. This photo was taken in 1999 at Sefton Church in Merseyside, England, and was taken by a photographer who was fascinated by the ancient structure. 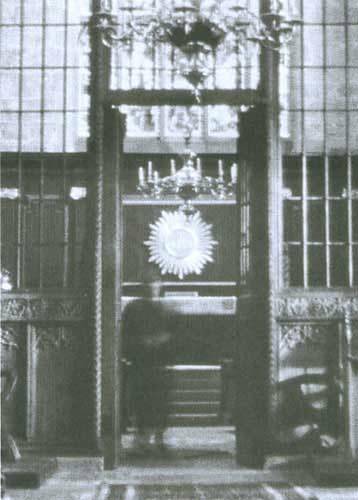 The photographer says that there was no one standing there when he took the photograph and theorizes that due to the phantom’s attire that it is the apparition of one of the church’s ministers back from the dead. This photo made the rounds on the Internet through email chain letters and has thus become one of the most famous ghost pictures in existence. It seems to be a realistic ghost picture as it is subtler than most photoshopped forgeries. There are no real credible sources to get the story behind the photo from, but going on the background and apparent ethnic origin of the girls many have assumed that they are in Manilla, Republic of the Philippines. My first thought is that this is a fake photo created in Adobe Photoshop, but I have the tendency to say that about all contemporary ghost pictures. This image was caught in 1984 during a paranormal investigation of a Toys R Us store in Sunnyvale, California. 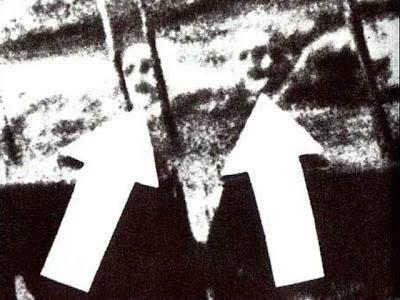 It is said that infrared and normal pictures were taken during a séance and when the film was developed the infrared photos showed the image of a man who was not present in the normal photo. The man also appears to be wearing clothing that was out of place for that time period. It is claimed that paranormal activity sill plaques this Toys R Us location to this day. Many churchgoers who attended church at The Church of St. Mary the virgin in Northampton, England claimed that a ghostly figure would appear during service and would start praying, and in 1964 photographic evidence of this restless spirit’s existence was captured. Photographer Gordon Carrol snapped this photo in an attempt to capture the Church’s beauty but upon developing his picture discovered he had capture what appeared to be a ghost. "The lady in the color photo is my granny. She lived on her own until age 94, when her mind started to weaken and had to be moved to an assisted living home for her own safety. At the end of the first week, there was a picnic for the residents and their families. My mother and sister attended. My sister took two pictures that day, and this is one of them. It was taken on Sunday, 8/17/97, and we think the man behind her is my grandpa who passed away on Sunday, 8/14/84. We did not notice the man in the picture until Christmas Day, 2000 (granny had since passed away), while browsing through some loose family photos at my parents' house. My sister thought it was such a nice picture of granny that she even made a copy for mom, but still, nobody noticed the man behind her for over three years! When I arrived at my parents' house that Christmas day, my sister handed me the picture and said, "Who do you think this man behind granny looks like?" It took a few seconds for it to sink in. I was absolutely speechless. The black and white photos show that it really looks like him." It only seems fitting that this unsettling photo would come from what is arguably the paranormal capital of the world, Romania. This photo soared to fame after it was published in a Romanian newspaper and republished countless times after. The photo was taken in a 150-year-old hotel named the Decabal Hotel. A guest who was staying there by the name of Victoria Iovan took the incredible picture. The hotel is the source of a very old legend. The legend says that long ago a Roman treasure was hidden where the hotel now stands and the ghost appears when someone ventures too close to its location. Nearly every town has a similar legend: A long time ago a school bus got stuck on a railroad track and a train plows into the bus killing the children inside the bus. Today, if you pull up to the track and turn off your car, the ghosts of the children will push your car uphill across the tracks. San Antonio, Texas is no different as they have a legend just like the one I described that is centered on a set of mundane railroad tracks. The difference between this legend and the others though is that there may be photographic proof of Texas’ haunted railroad. A family who went to the track to test the legend took the above photo. The inexplicable, ghostly figure of a young girl is clearly present in the picture. I want to stress that I am not presenting these photos as absolute fact. I am merely presenting them and the supposed true stories that accompany these spine-tingling photographs to you for entertainment value. Whether or not these photos are definitive proof of an afterlife is absolutely debatable and up to you to decide.